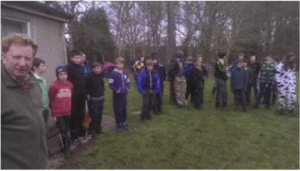 On Friday 14th March over one hundred scouts and guides took part in the annual Guildford West District Scouts Night Hike from Tongham Scout HQ to Normandy Scout HQ via a cross country route involving a range of incidents along the way. 19 teams from 2nd Guildford, 1st Normandy, 1st Stoughton, 4th Farnham (Tongham), 1st Rydes Hill, St Nicolas 9th Guildford, 1st Rydes Hill (St Marys) Guides and 1st Onslow Guides participated in the event which took place under a very helpful full moon and fine, clear skies. Teams were either accompanied by adults or Young Leaders (training teams) or unaccompanied (competition teams). The field of teams was more than twice the size of last year’s event with many new teams from outside Guildford West District Scouts. The course took teams between 3 and 5 hours to complete and required good navigational skills, physical fitness, teamwork and mental agility. Teams were scored on their performance at check-points and their ability to navigate the course. All teams performed really well with few navigational problems. Once teams had finished they camped over at Normandy Scout HQ. The winner of the competition event was St Nicolas 9th Guildford B team who narrowly pipped St Nicolas 9th Guildford A team and 4th Farnham (Tongham). Scores in the competition category were improved on last year demonstrating the high quality of the field overall. In the training event, 2nd Guildford Scouts held off strong competition from Rydes Hill Guides to win their category. The two leaders were neck and neck on scores from the bases but a faster time covering the course clinched it for the scouts. Probably the greatest challenge of the night was finding the mouse which had decided to take up residence in one of the Rydes Hill Guides tents. The organisers are considering tightening the rules to prohibit pets for next year. We look forward to seeing the teams back for the event next year. We are grateful for the support and assistance from many people without whom the event wouldn’t have happened, and to 4th Farnham and 1st Normandy Scouts for the use of their HQs.